Usually found only during the Chinese New Year season, this unique vegetable comes in a beautiful rosette with dark green leaves. 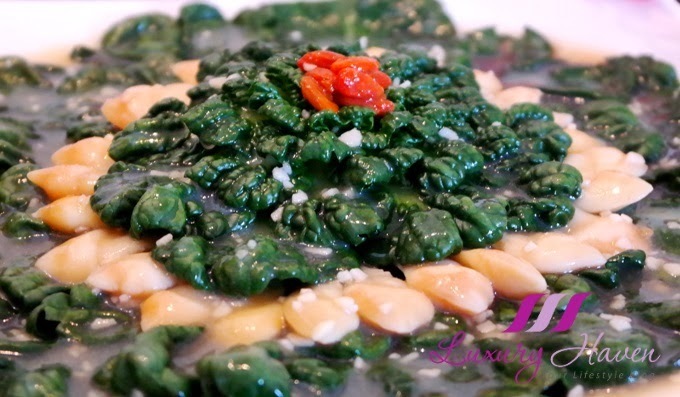 The name Fu Gui Cai (富贵菜) means Prosperity Vegetables in English. So how does it taste like? Looking at the dark leafy vegetables, most would've thought the taste would somewhat be on the bitter side, like the Kailan. But I would think the #FuGui vegetables tasted more like Baby Cabbages, or what we call Bok Choy (小白菜). 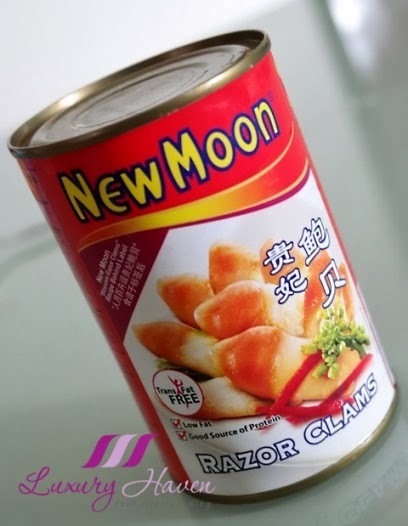 My mom gave me an assortment of canned clams recently, and one of them is the New Moon Razor Clams from Chile. Staring at the Fu Gui Rosette, the Razor Clams seemed to be perfect match both in taste and presentation. Don't you think the result is eye-catching? 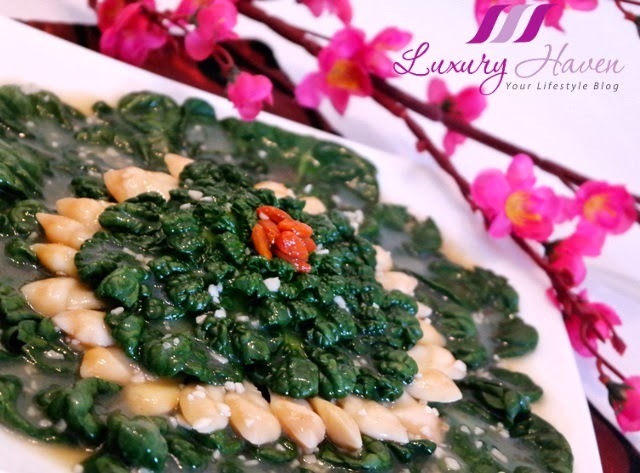 The dish is just great for the coming Chinese New Year! 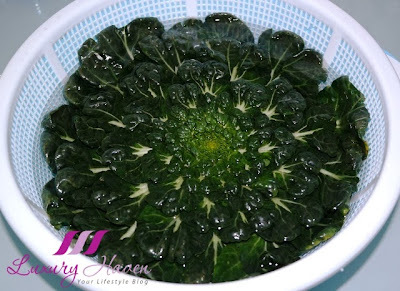 Soak vegetables in salt water to get rid of any tiny insects etc. Blanch vegetables and drain. Place it on a serving plate. 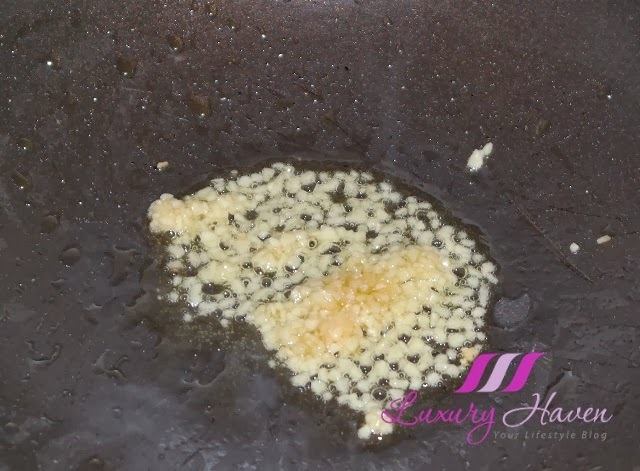 Heat oil and sautéed garlic till fragrant. Add ginger, clams, water and stock. Followed by seasoning and #wolfberries. Cook for about 1 - 2 mins. Mix in cornstarch to thicken the sauce. 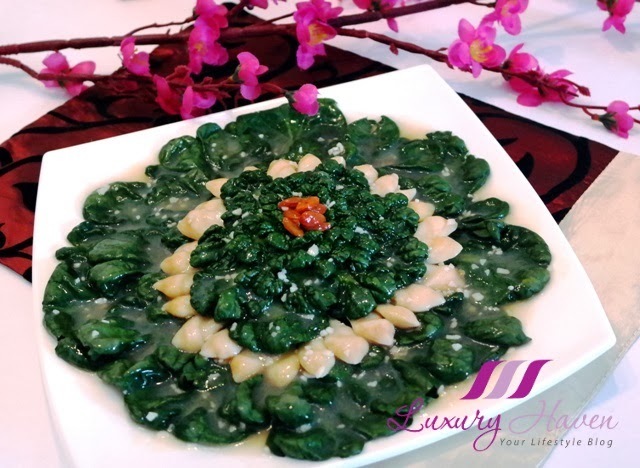 Transfer onto vegetables, and you're ready to present this pretty Fu Gui Cai with Razor Clams (富贵菜炒鲍贝). * Use a teaspoon to plate the razor clams if you like. This looks beautiful Shirley! Bet it tastes awesome! Mike, it's very unique kind of vegetables. Tastes good! You sure a great cook. How many people are you going to cook for cny? cquek, it's fun playing with it! What a fantastic recipe and it looks amazing! Be sure to stop by my link party, #OmNomNomFriday, and share your delicious creations. Thank you! And I am glad to be back to viewing your posts again, I have missed this! Uru, glad to have you back! Thanks, sweetie! Aemy, hahaha! You're real cute! Hmm this looks delicious *__* Thank you for sharing the recipe! Louise, thanks for the great info! Wish we could draw it out instead of explaining. Love to see your live drawings instead of googling for pix. Heehee! All of those greens must be really good for you. 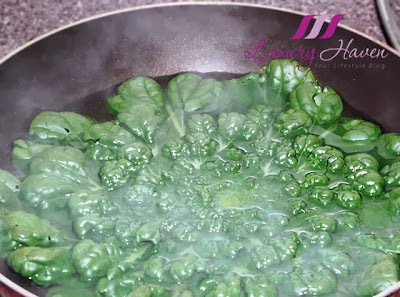 YL, more greens are good for us :) Have a wonderful week! Gorgeous presentation! I've never had razor clams before. Happy new Year! Abbe, thanks dear! It's my 1st experience! I didn't know this is called Fu Gui Cai! 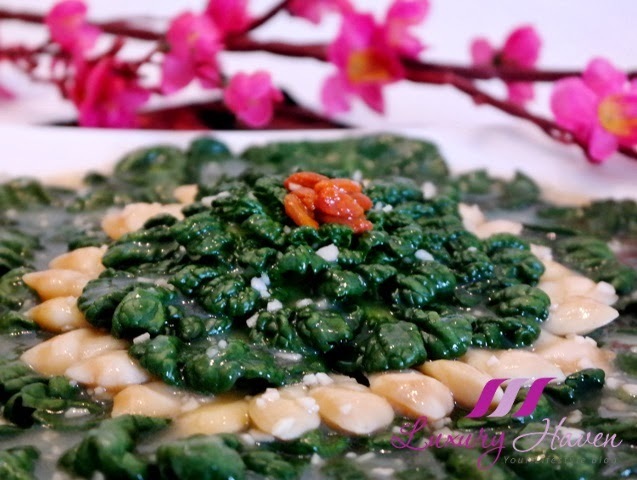 Love the presentable of this lovely and green dish. YL, nice name! Don't you think so?? Thanks, sweetie! Looks delicious and I love the beautiful plating. I don't think i've had fu gui cai before..so curious now about the taste! Lovely presentation, the last photo can be used for a cook book front page, it so perfect. Subha, that's so sweet of you! Thanks, sweetie! Aw! lucky you given that my friend! Dedy, you're serious?? Then you must stock up the next time you're in SG. It's pretty economical here! You are such a neat perfectionist! Look at how you even arranged the vegetables in the sieve and plate. Beautiful. I love how you arrange the vegetable, so healthy and tasty! Have a Happy Chinese New Year! Veron, thanks for your wonderful note & Happy CNY to you too! Pepper, you're seriously sweet! Thanks so much for your kind note! I just saw this vege for the first time at Tesco. Google the recipe and found your blog. Decided to give it a try coz it looks so yummy! One question though, does this mean you don't need to cook the vege at all?? 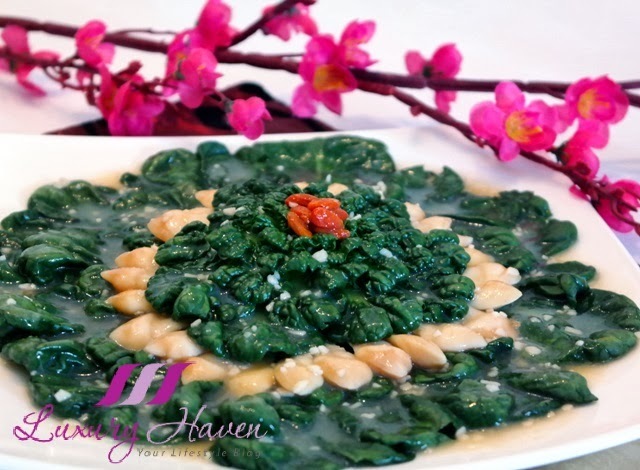 You'll enjoy fugui chai if you like kailan. As per photo steps above, you'll need to blanch the vegetables first, meaning put it in boiling water then remove it after couple of minutes so that you won't over cook it to retain the crunch. It's great having you here & hope to see more of you. Do check out the rest of the CNY recipes I've been posting the past week. Have fun cooking & Happy CNY!